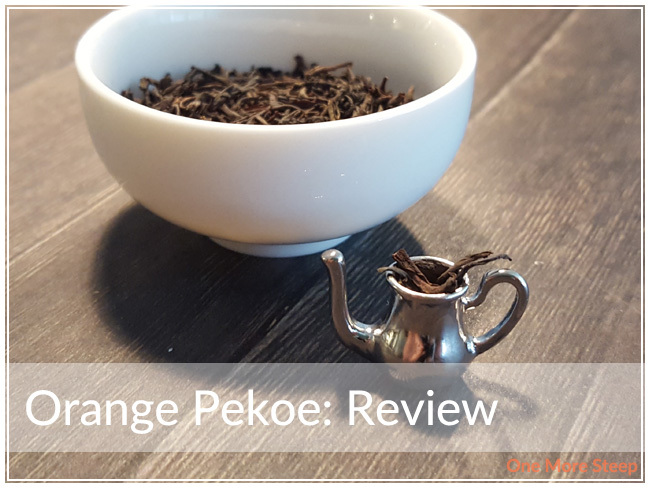 Orange Pekoe is one of my absolute favourites, and it was recently pointed out to me that I hadn’t reviewed DavidsTea’s Orange Pekoe despite reviewing pretty much all of their other teas because their stores are so convenient to me. DavidsTea boasts that their Orange Pekoe is “the perfect pekoe”, which makes me want to give them some side eye because I love orange pekoe and have yet to meet one that could overtake Red Rose as my absolute favourite (partially due to nostalgia, partially due to economic value). DavidsTea’s Orange Pekoe consists of “fine black teas from Ceylon, Sri Lanka”. The dry leaf has a woody and vegetal smell to it that reminds me a bit of hay. My preferred method of drinking orange pekoe is with sugar or honey and evaporated milk. We’ll see how it does to stand up to my way of drinking orange pekoe. Orange Pekoe steeps to a beautiful golden orange that I’m quite familiar with. The smell reminds me a lot of Red Rose, not going to lie. 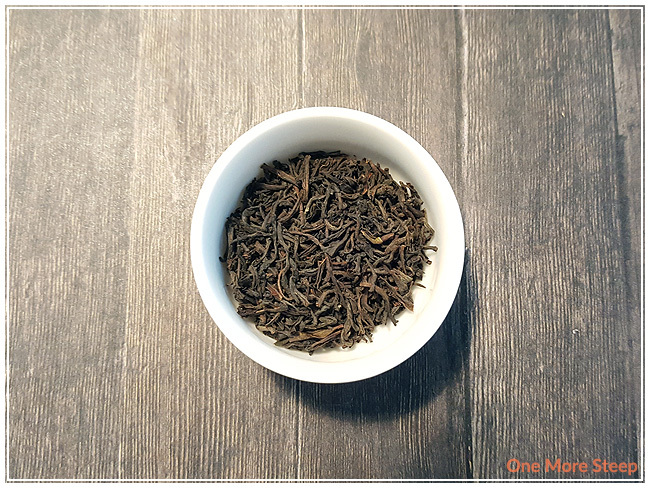 There’s a pleasant familiarity with the tea, and I must say it doesn’t really stand out from other orange pekoes that I’ve tried before in terms of smell. When I first sipped it, there was a moment where I was a bit bowled over by the combination of malty flavour and astringency and… bitterness? There is a mild bitterness to the tea that I wasn’t expecting because I did steep it for less than the recommended steeping time (3 minutes versus 4 to 7 minutes). I wound up adding some sweetener (honey) and evaporated milk, Hong Kong-style milk tea that I learned from my mom. Much better! 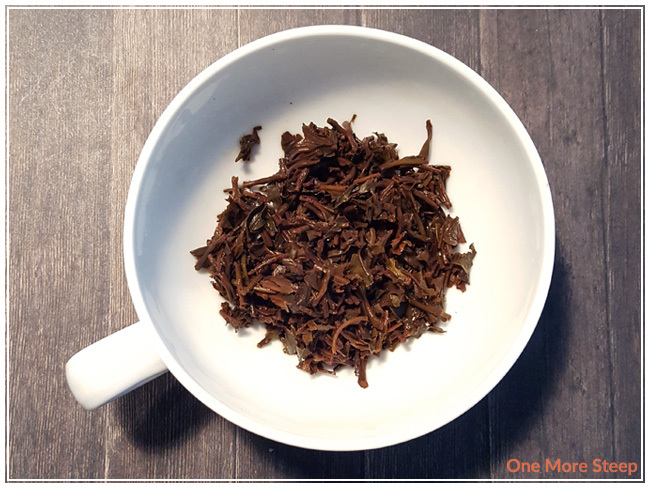 I resteeped Orange Pekoe (for 3 minutes) and found that the taste was consistently the same. Astringent, malty, and bitter! I did not opt to steep the leaves a third time. I thought that DavidsTea’s Orange Pekoe was just okay. 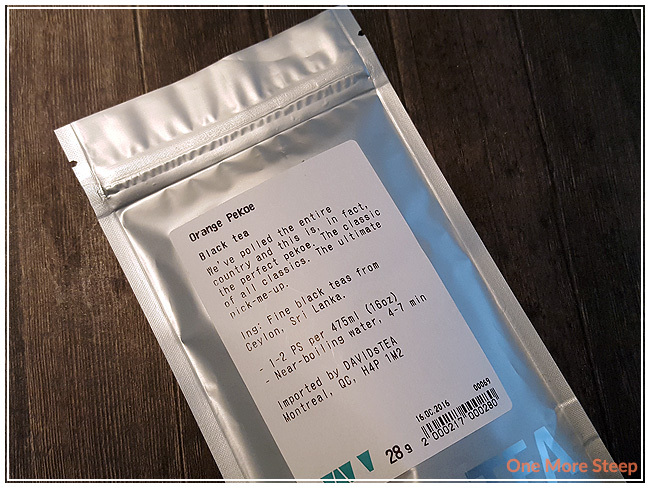 I was really disappointed that Orange Pekoe ended up being bitter despite steeping for less than the recommended time, it doesn’t make me feel confident in their recommended steeping times at all. 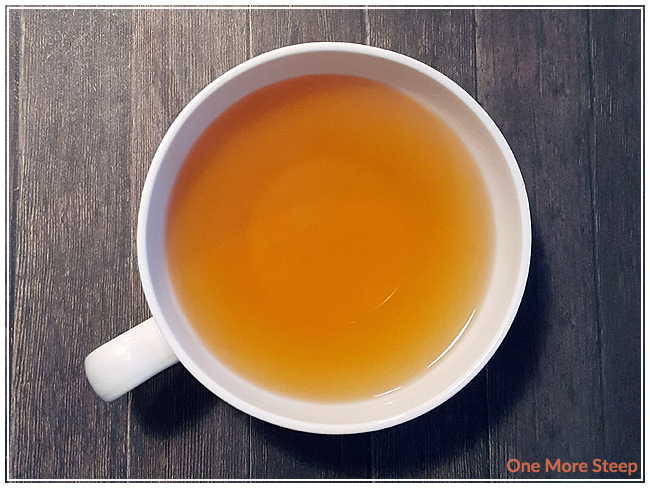 I think the saving grace for Orange Pekoe is that it did well when turned into a milk tea – the addition of sweetener helped to temper the bitterness, and the milk did wonders for the astringency. I feel that there are other orange pekoes that are much more affordably priced, or just better value for the taste. DavidsTea’s Supreme Pekoe, which is only $1 more for 50g of tea, is a better buy I feel because it just tasted better. Best pekoe, this Orange Pekoe is not. I’ll finish the bag, but it’ll be doctored up to my tastes rather than being drunk straight.